The swaddling of babies - wrapping them firmly in strips of cloth - was once the prevailing custom in many parts of the world, including this country. The custom dates from ancient times, and is protective in origin. 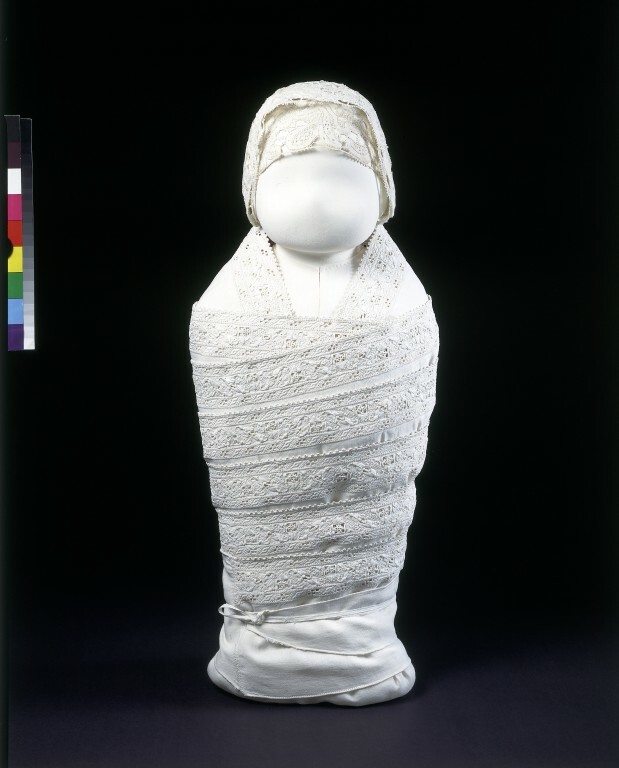 A swaddled baby would be warm, and its lack of movement kept it safe from accidents such as falling out of the cradle or into the fire. 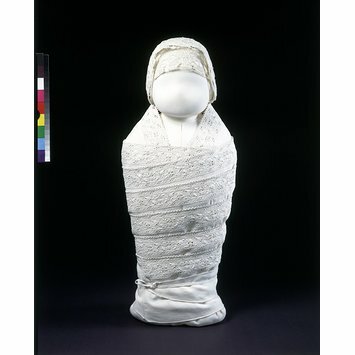 Swaddling was also thought to prevent the limbs from growing crooked. Dressing and swaddling the baby could be time-consuming. By the 16th century, the baby usually wore a nappy, at least one cap and a shirt. The person dressing the child would then wrap it in a blanket and roll bands of plain fabric round and round the body. Richer families often finished the process with bands trimmed with lace, a woven edging or embroidery, as in this example. They might wrap them round the baby in a pattern as well. Swaddling was once customary in rich and poor families alike, but few swaddling bands survive today. The exceptions are the decorated examples that the wealthier families owned. The plain bands must often have become stained and worn and were then thrown away. By about 1800 the British had stopped swaddling their babies, although the custom continued in many other countries, notably Italy, Germany and Russia. with a band of whitework and cutwork embroidery along part of one edge. The band is rectangular, composed of five separate sections stitched together: the first is rectangular and plain; the second and third are rectangular with the 4 cm deep band of embroidery along one edge; the fourth and fifth are plain, combining to make a triangle with a pair of tying strings stitched at the end. The embroidery is in a formal geometric design of alternating triangles and diagonals, executed in satin stitch and eye stitch with small cutwork panels. bands and any wadding which may have been used.